I love my new bulletin board. 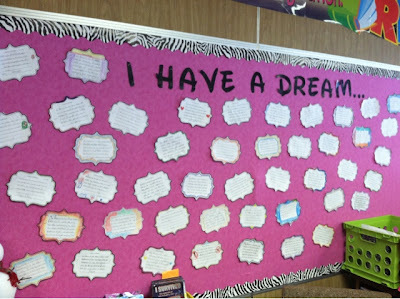 After watching a few video clips and holding a deep discussion with my class about what MLK accomplished in his lifetime and what they could possibly accomplish, they set off to write down their dreams. Not only was their writing based on creative ideas, but they also wrote about what they will do to achieve their dream. The students responses were heartfelt and innocent and ranged from wanting to create apartment buildings free of charge for homeless people to live in to wanting to go to the new Sandy Hook Elementary School and make all the children feel safe, happy, and secure. We've been focusing on empathy and it was great to see the students putting it to use! You can find it here at our TPT store!